Sarah Montgomery Finds Full Time Ride for 2019. 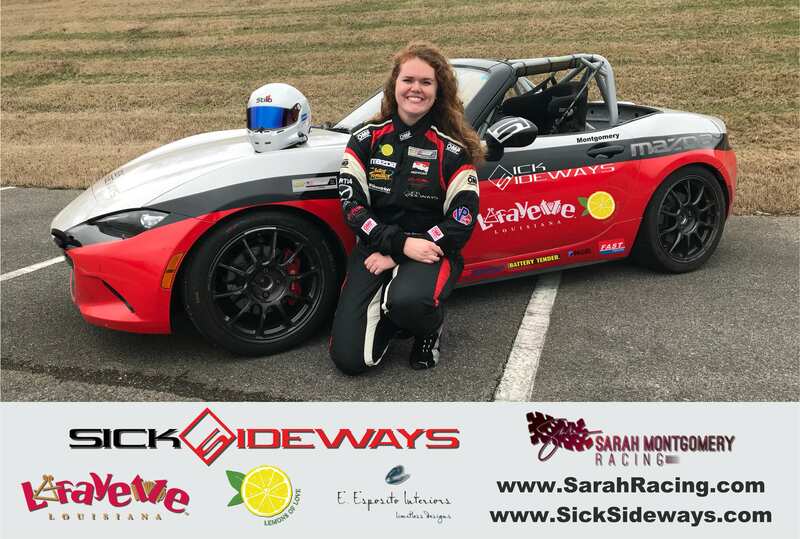 Lafayette, LA/Sebring, FL, (March 4, 2019) – Sarah Montgomery Racing and Sick Sideways are pleased to announce that in 2019, Sarah will be competing with Sick Sideways for a full season effort in the ND-1 Battery Tender Global Mazda MX-5 Cup Series Presented by BFGoodrich Tires. Montgomery is no rookie to the Global Mazda MX-5 Cup Series as she was a passionate competitor from 2014-2016, finishing 10th in points in her rookie season. Although she has been a part of the series in previous years, this will be her first season with the most winningest team in the paddock, Sick Sideways. “To say I am thrilled is quite the understatement as I am absolutely honored and humbled to be a driver and brand ambassador for Sick Sideways. For over 3 years I have wanted to be a part of the team and I am ecstatic everyone’s hard work is turning my dream into fruition,” says Montgomery. Follow Sarah and Sick Sideways this 2019 racing season through LIVE TIMING and LIVE STREAMING for each event listed below. Several partners are working with Sarah Montgomery and Sick Sideways to keep her in the race car for the entire 2019 MX-5 Cup racing season. Sick Sideways (Sebring, FL. ), Lemons of Love (Mount Prospect, IL. ), Lafayette Travel (Lafayette, LA. 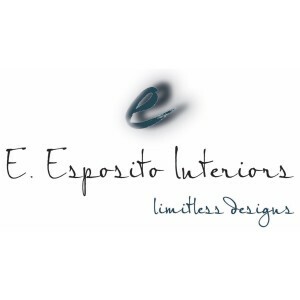 ), E. Esposito Interiors (Truckee, CA.) and many others have stepped up to help Sarah. With the start of the season less than one month away, Sarah is continuing to look for prospective partners to help offset costs. To contact Sarah, please email Sarah@SarahMontgomeryRacing.com or visit her website at www.SarahRacing.com. Los Angeles, CA.— On December 19, 2018, Sarah Montgomery and Ashton Harrison were flown to Los Angeles, CA by Steve to make an appearance on Steve Harvey’s talk show. The ladies were lucky enough to have a Ferrari as their car for the weekend thanks to Ashton’s partner, Merlin Auto Group, and spent a few days in the amazing city as tourists. Steve Harvey did a complete makeover on Sarah and Ashton to look their best on national television because they were a part of Steve’s dating segment. The show spent many weeks prior to filming to find the perfect four guys for Sarah and Ashton to choose from to go on a date with. Filming took place on December 20, 2018 and the show aired on January 10, 2019. Be sure to follow the link to watch their dating segment and to see who they chose. Fans can follow Harrison and Montgomery’s journey at AshtonHarrison.com and SarahRacing.com. 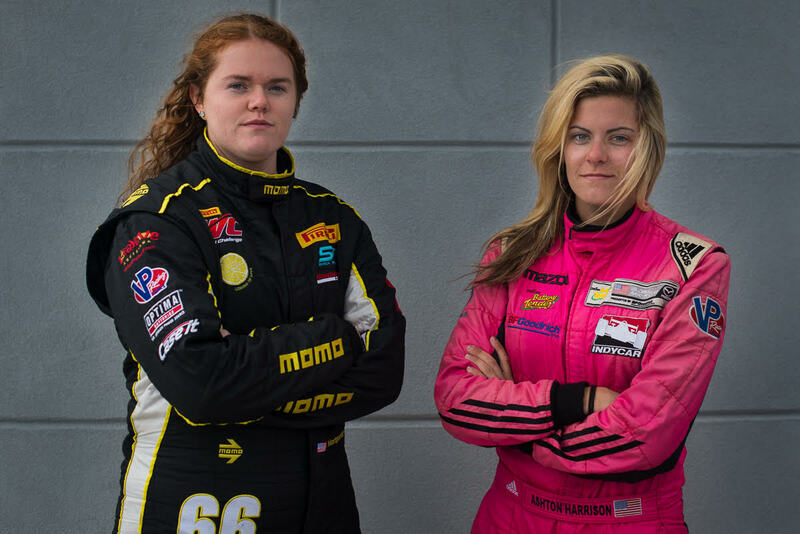 VILLA RICA, Ga.—Ashton Harrison and Sarah Montgomery have been co-drivers in several endurance races this season, and they are both ready to take their racing careers to the next level by entering the new TCR class in IMSA Continental Tire SportsCar Challenge. Their goal is to be the first full-time, all-female lineup in the series, and they are currently searching for sponsors for the 2018 season. Harrison and Montgomery are currently working with Sick Sideways Racing to find sponsors and secure a full-season program in the TCR class for 2018. TCR is the much-anticipated new class in IMSA’s popular Continental Tire Series and will feature the “touring car” style that is popular in Europe. The 23-year-old Harrison has most recently been competing in the Global Mazda MX-5 Cup Series. In 2017, she earned five top-ten finishes and ended the season 12th in points. In between races, Harrison is a full-time instructor for Porsche and the owner of Ashton Harrison Motorsports, which offers racing programs for all driver development. In her hometown of Villa Rica, Ga., she serves as a career mentor at her high school and volunteers at animal shelters. Montgomery has been racing since she was 13 years old, when she started karting. The Lafayette, La., native ran in the 2015-2016 Global Mazda MX-5 Cup Series for two years, finishing top ten in points in her rookie season. In 2017, at 22 years old, Montgomery teamed up with Shea Racing to drive a Honda Civic in Pirelli World Challenge. She has partnered with organizations such as Lemons of Love and Lafayette Travel. Most recently, Harrison and Montgomery teamed up with Christian Szymczak for the 25 Hours of Thunderhill, racing the Harrison Contracting Co./Tactical Flight Service/Lemons of Love/Lafayette Travel Global Mazda MX-5 Cup car prepared by Sick Sideways Racing. Fans can follow Harrison and Montgomery’s journey to being the first all-female TCR team online at AshtonHarrison.com and SarahRacing.com. Lafayette, LA – Coming from the heart of Cajun Country, 22 year old Lafayette native and University of Louisiana at Lafayette graduate in Marketing, Sarah Montgomery, will be making her Pirelli World Challenge TCA debut as she joins the Shea Racing Team driving a Honda Civic SI. She will be sponsored by The Lemons of Love cancer patient support organization and Lafayette Travel, her home city’s Visitors Commission. 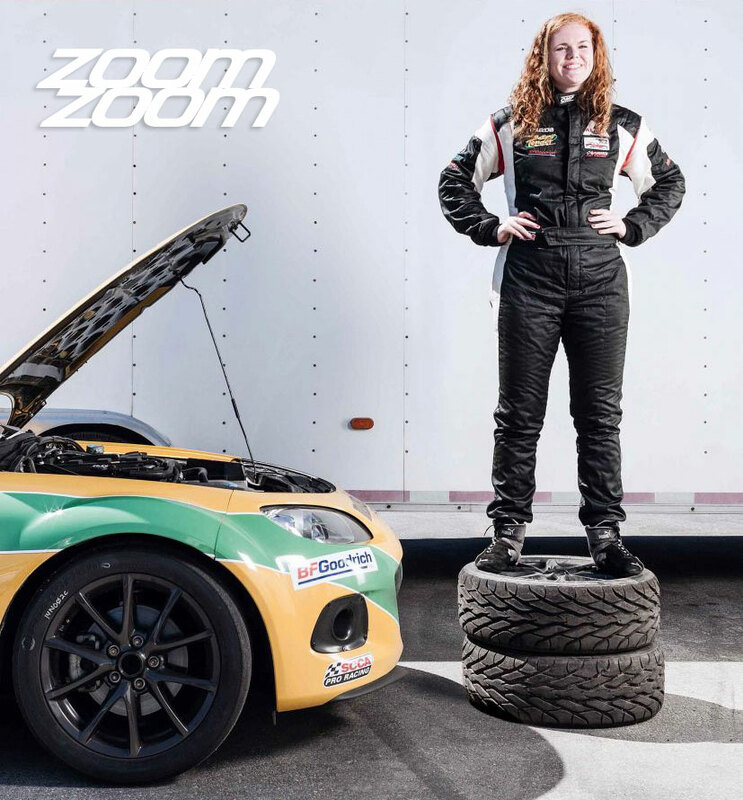 After competing in the Battery Tender Mazda MX-5 Cup Series for the past two years, Sarah spent 2015-2016 learning many different tracks and gaining the experience needed to become a talented driver. “I’m really a grass roots racer, raising money from the ground up”, says Sarah, “The hard work and support I have received from people to get this opportunity is nothing short of amazing. I am so thrilled to give my sponsors the chance to be on National Television and to help promote my brand through CBS Sports Network”. The PWC TCA races are all double-headers and start in April at VIR with stops at Canadian Tire Motorsports Park, Lime Rock, Utah Motorsports Campus, COTA and Mazda Raceway. Based in Groveland, Florida, Shea Racing is a professional Touring Car team competing in the Pirelli World Challenge Championships. Within the seven years Shea Racing has been competing in the series they have secured several wins and podiums in the touring car classes. Focusing on a strong team foundation, top performances, and driver advancement and individualized marketing platforms, Shea Racing has become of the Pirelli World Challenge’s Top Tier Touring Car teams. Mazda is the only manufacturer with a clearly defined path for amateur racing drivers to take on the way to the top. And it doesn’t just include the open-wheel series in the formal Mazda Road to Indy—racers who compete in MX-5 Miatas or other Mazda vehicles will also receive assistance so that they too can ascend to the next rung of the ladder. So they got her a racing kart, and Sarah started on the dirt oval tracks around her home in Lafayette, Louisiana. She started winning races, then track championships, then she was invited to participate in a Skip Barber shootout that used shifter karts. “That’s my daughter,” her dad said proudly. Thus began a relationship with Jeff Mosing, a Mazda MX-5 Cup racer, who just happened to notice a kart going fast on a parking lot. 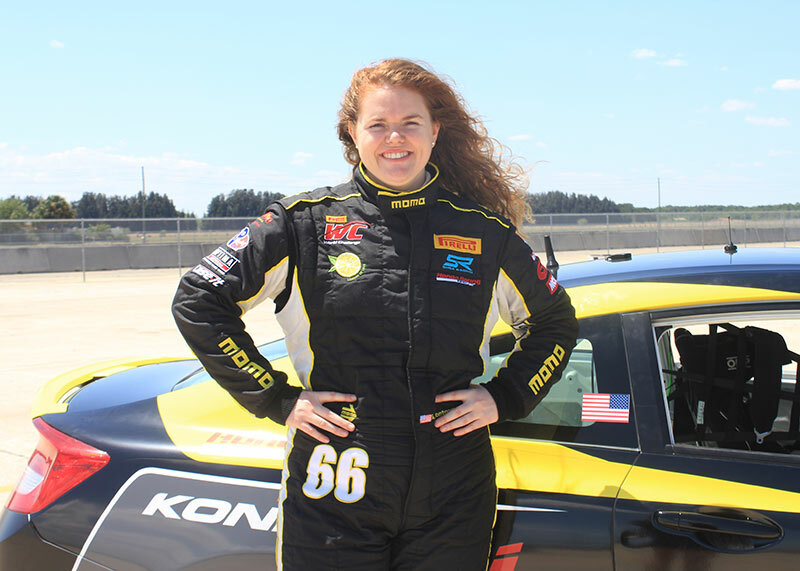 Mosing, along with former racer Roy Johnson, became Sarah’s mentors and backers, guiding her into the Mazda MX-5 Cup series. And that’s where she is now, at Mazda Raceway Laguna Seca as part of the potent ALARA Racing team, which Mosing also drives for. After a solid pair of races at Mazda Raceway, out of 26 drivers in the series, she is 11th in points. Courtesy of Zoom Zoom Magazine | Read entire article here.